Introduction to the Delta Wye Transformer connection, part 6d. This is where we left off in part 6c. In this part, we're going to explain what this means and how this works. Now we said in our last video that, this is often referred to as the open form phasor diagram. And this is often referred to as the close form phasor diagram. 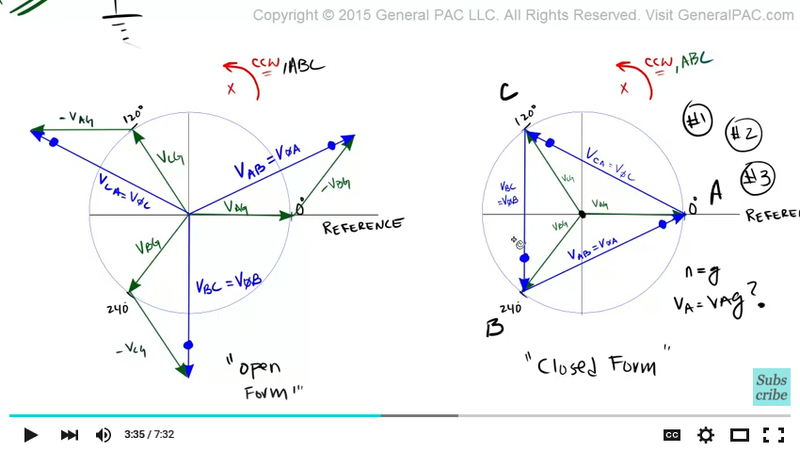 The open form vs close form phasor diagram have their own advantages and that's what we're going to about in this video. When I was first learning this, the closed form phasor diagram was very confusing. I never understood it. To be honest, it was only recently that I actually understood what was going on here. The open form was always a lot easier to visually and conceptually understand but this closed form – ahh it's a work of art. So the way that it works is that, first of all, it's really helpful to label our phasor windings to get a visual understanding. Now this phasor here – that's VAG. And it's pointing to this corner of this triangle so I'm going to call this A. This is VBG and it's pointing to this corner here so I'm going to call this B. 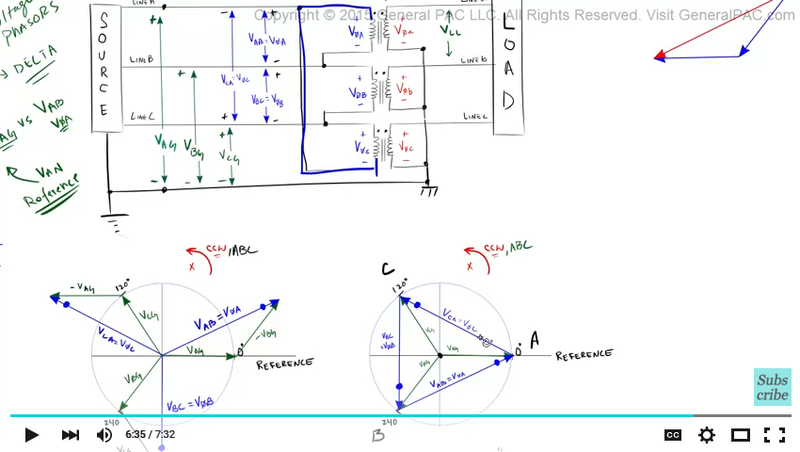 And this is VCG and it's point in this direction here so I'm going to call this C.
The number one problem for the closed form phasor diagram is that – the shape of the triangle makes us mentally think that the triangle represents line-to-ground voltages A, B, and C of the power system. And we clearly see that it doesn't. The triangle actually represents the line-to-line voltage of the delta transformer connection but that is also equal to the winding voltage. But our line-to-ground voltage are these inner phasors. That's one of the problems of this closed form. That it makes us think differently when we first visually inspect it. The second problem of the closed form phasor diagram is that when we look at this, we think the origin represents the neutral or the ground. And by inspection, the neutral is equal to the ground. And the question comes up – why is VAN equal to VAG. The last thing is – number three, the most confusing thing about the closed form phasor diagram is that why is VAB and VBC and VCA shown in this particular manner? It appears that the voltage drop (for VAB for example) – this voltage drop should be from B to A right? Because the arrow is pointing in this direction. So this voltage drop is from B to A. But we've down is VAB. Same thing over here. When we initially inspect it, it appears that the voltage drop – this phasor – should be VAC because we start from A and go to C. But in reality, it's VCA. Same thing over here. By inspection, it appears to be VCB. But in reality, it's VBC. So the voltage drop isn't as what we've defined it – that's the third reason why the closed from is so confusing. Although it has it's confusion, the content is very true and very correct. We jut have to understand what this is telling us. And if we compare that to the open form, everything becomes very clear. We know what VAG, VAB, we know what's lagging and what's leading and how much it's lagging or leading. So what's the benefit of the closed form phasor diagram? The biggest benefit this form provides us – it tells how the transformer windings for Delta is connected. Let me repeat. This phasor diagram tells us how the transformer windings for the delta connection – how those windings are actually connected. This is the trick that I'm going to explain. 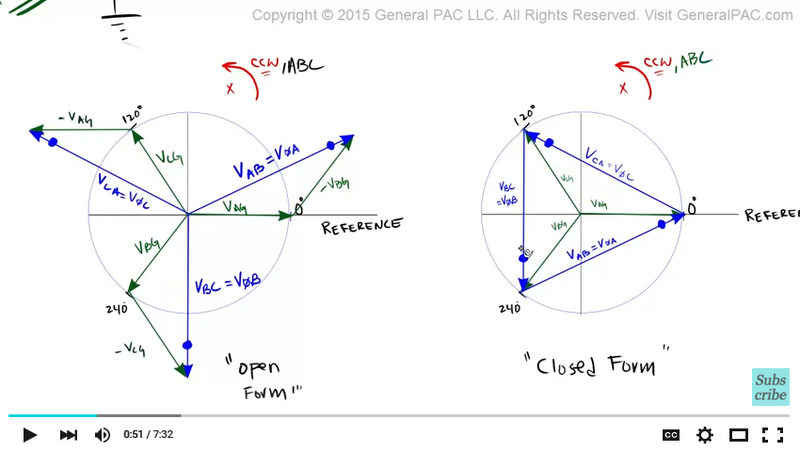 This is what's really neat about the closed form phasor diagram. You see this phasor here? We defined this as the phase A winding. So we've defined this phasor here as V phase A right? 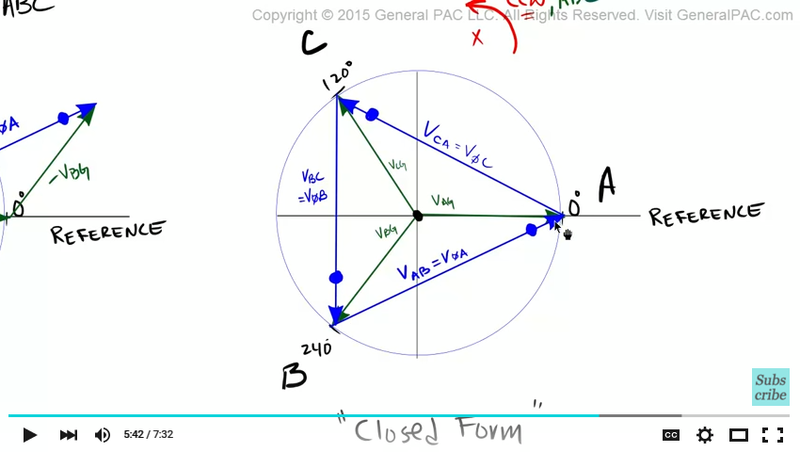 And we said that this side here – the dotted side is the polarity side of V phase A. Look at what the polarity side of V phase A is connected to. It's connected to the non-polarity side of V phase C. The polarity side of V phase A is connected to the non-polarity side of V phase C.
Now look at what the polarity side of V phase C is connected to. That's connected to the non-polarity side of V phase B. And the polarity side of V phase B is connected to the non-polarity side of V phase A. Let's back up. Let's compare it to the actual connection. We're saying that the polarity side of V phase A is connected to the non-polarity side of V phase C. The polarity side of V phase C is connected to the non-polarity side B. The polarity side of V phase B is connected to the non-polarity side of V phase A. So this closed form phasor diagram represents how the transformer is physically connected. And that's the most important thing that it tells us.